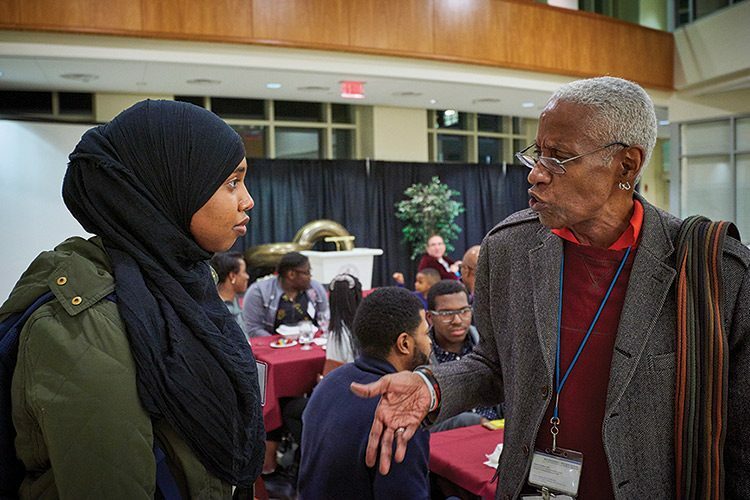 Samira Gure ’20 (above, left) was one of many students who interacted with alumni like Robert Fullilove ’66 (right) during Mosaic Weekend beginning Oct. 19. 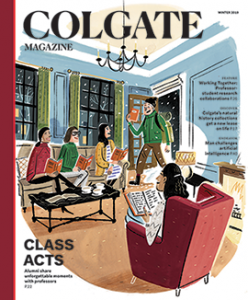 The annual event was created “for students of color to meet and talk with alumni of color who share wisdom and stories about their experiences while being a student at Colgate,” said Veronica McFall ’89, assistant director of alumni relations for affinity and identity programs. These conversations continued throughout the weekend as students and alumni discussed topics ranging from the best ways to leverage the Colgate network to identities in the workplace to the importance of remaining focused on goals throughout their undergraduate years. Keynote speaker Michèle Alexandre ’96, the University’s first black valedictorian, highlighted how the struggles of people of color throughout the years paved the way for the diversity at Colgate today.